Yesterday my long awaited syringe arrived - taking samples with the siphon is a huge fuss just to fill a 200 ml measuring tube, so I ordered a 100ml syringe and that makes the whole measuring thing a world easier. 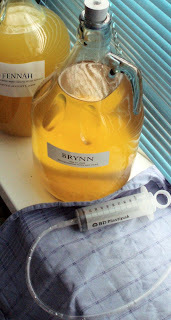 I'm happy with that, and it seems to have come to a real halt anyway, so I racked Brynn off the yeast cake today and will now let it sit until I get back from holiday, when I'll bottle it. Edit: belated decision to use the vanilla beans I bought a couple of weeks ago - now would be a good moment to add. One bean cut open along the side, pressed open slightly so fluid can get in, and added to the demi.